What goes up, must come down. Today, Bitcoin has a 30% difference in spread for day highs to day lows. It shouldn’t surprise most that a made up currency, with no tangible asset backing as protection, would have such serious intra-day swings. The true test of BTC as a viable currency will be the test of time. The market will dictate the true market value. So while this may not be “The Bitcoin crash”, it will surely scare away many investors who depend on consistent gains. 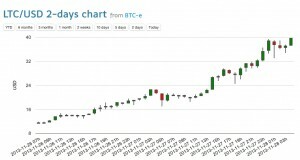 Altcoins are not escaping todays correction either, with LTC back down well under $30. It doesn’t help matters that Bitcointalk has been down all morning. Bitcointalk is one of the most trafficked Bitcoin sites where anyone from newbies to experts share anything from how-to mine Bitcoins to advanced Altcoin mining configurations. Bitcoin isn’t the only cryptocurrency grabbing headlines lately. On the heals of Bitcoin breaking $1k USD, Litecoin is soaring off the charts. Many folks who think they missed out on the Bitcoin train are now cashing in on huge returns in Litecoin. 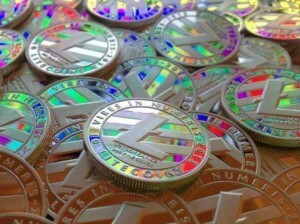 Even at $40, Litecoin(LTC) is much cheaper to buy into than Bitcoin(BTC) for the average trader. 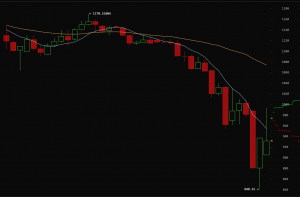 While Bitcoin is becoming popular with the masses, it still has many technical limitations(ie. transaction limitations), which makes Litecoin seem like a more viable suitor as the standout cryptocurrency. With cryptocurrency acceptance still in it’s infancy, only time will tell which currency will reign supreme. In the meantime, you can get in on the action trading LTC at Vircurex.